The newest addition to the Kawasaki family is called the Mule-Pro line and Kawasaki is justifiably proud of the new machines. While the hard working Mule has been a big part of the Kawasaki lineup since 1988, like the sturdy but none too speedy 4 footed beast it was named after, the Kawasaki Mules were often relegated to a long life of work. You rarely saw a Mule on the trail. The Mule Pro changed all that in a big way! 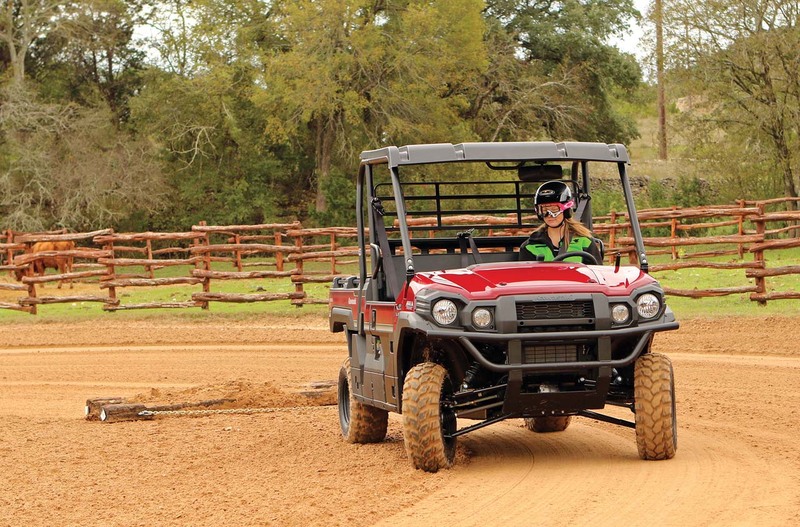 Last year we spent time with both the Mule-Pro FX and FXT, both gas powered machines. 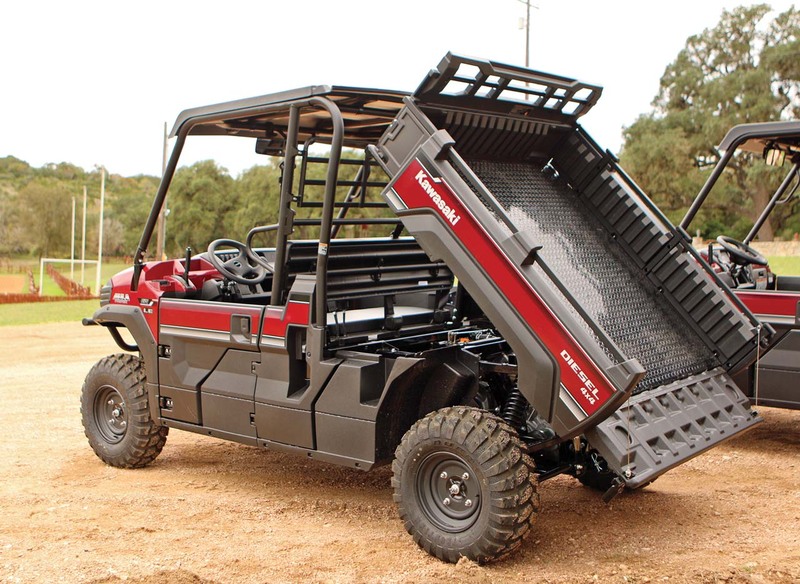 Kawasaki wanted to be sure the Mule-Pro retained all the hard working capabilities they’ve come to be known for, and a big part of that is being at home on the farm, construction site, and with construction crews in every type of industry. That means the ability to run diesel fuel. 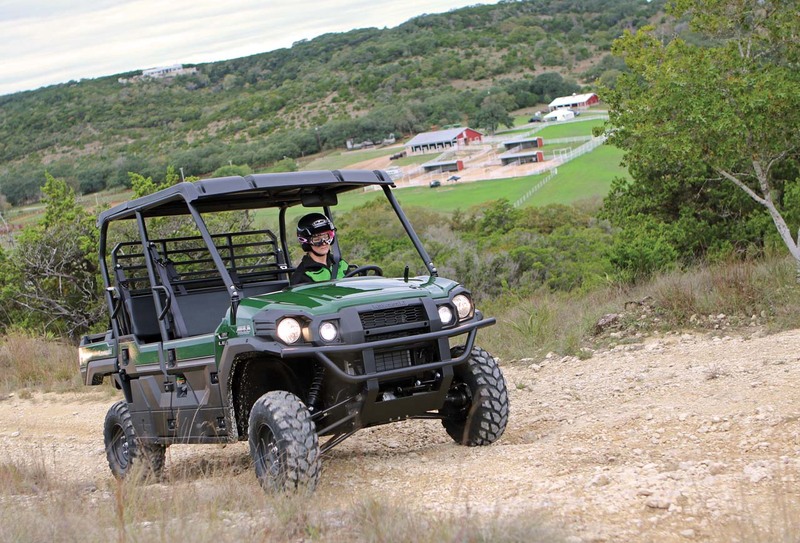 To meet that need, Kawasaki has introduced the Mule Pro-DX and DXT in six different configurations. We’re convinced the Mule Pro chassis is the strongest in the business. We haven’t been able to hurt one regardless of what we put in the back or hooked behind. Main chassis members are beefy steel tubes with plenty of cross bracing for support, and when each chassis is completed, it gets a chemical bath to remove any oils or contaminants, and then a powder coat finish for corrosion protection. The dual nature of the Mule Pro means it also needs serious suspension for rough trails or fields. Dual A-Arm independent suspension with 8.7 inches of wheel travel is used at both ends, and there is almost 11 inches of ground clearance. To bring any loads to a quick, controlled stop, 4-wheel disc brakes are used as well. 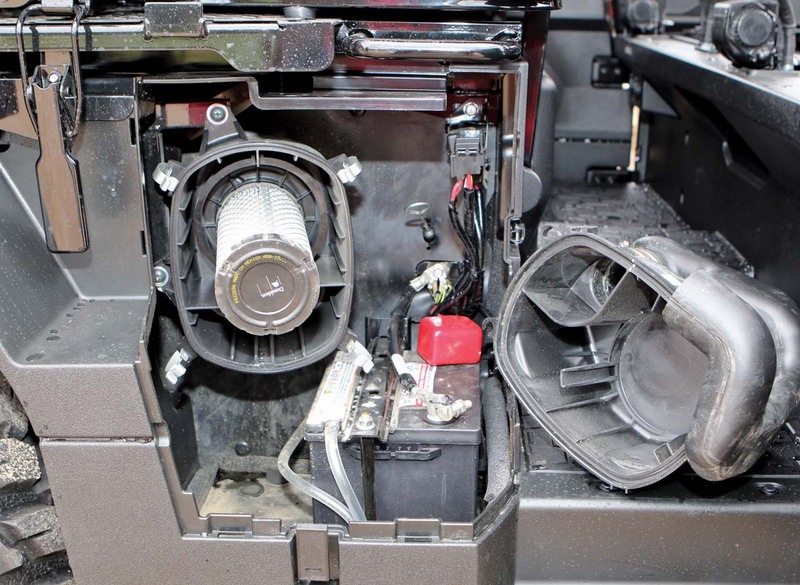 There are two versions of the Mule Pro with diesel engines, the Mule Pro-DX and the Mule Pro-DXT. While they share a common chassis and engine, the difference is the number of seats. 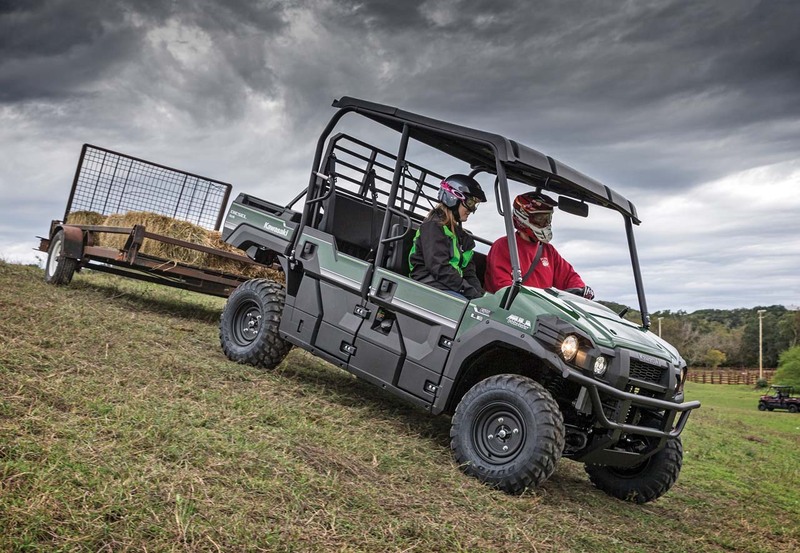 The DX model features a single bench seat built for three, while the DXT is the transformer of the UTV world and a second bench seat can be folded out to haul the whole work crew. Making the switch takes less than a minute and requires no tools. It’s an incredibly clever trick. Once in the front seat, you have plenty of room for your arms and feet, and pedal spacing is very good. All controls are dash mounted and we especially like the switch panel which is within easy reach. In the center of the dash is an excellent digital display. While we’re not exactly in love with the smooth, vinyl seat cover, we do love the huge storage area under the front seat. There is plenty of storage space both in and under the dash as well. 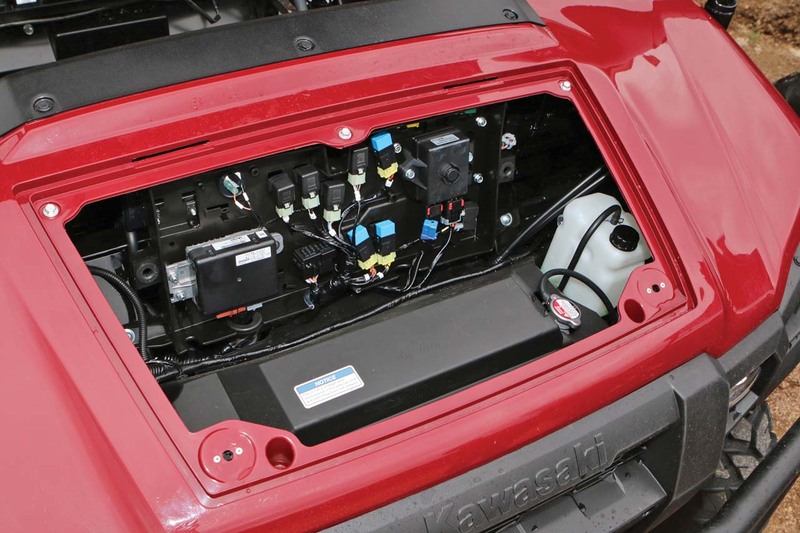 Under the rear seat (or cargo bed) is part of the engine and an easy access air filter. Back seat riders have ample room for three, and hand holds and seat belts help keep everyone inside. 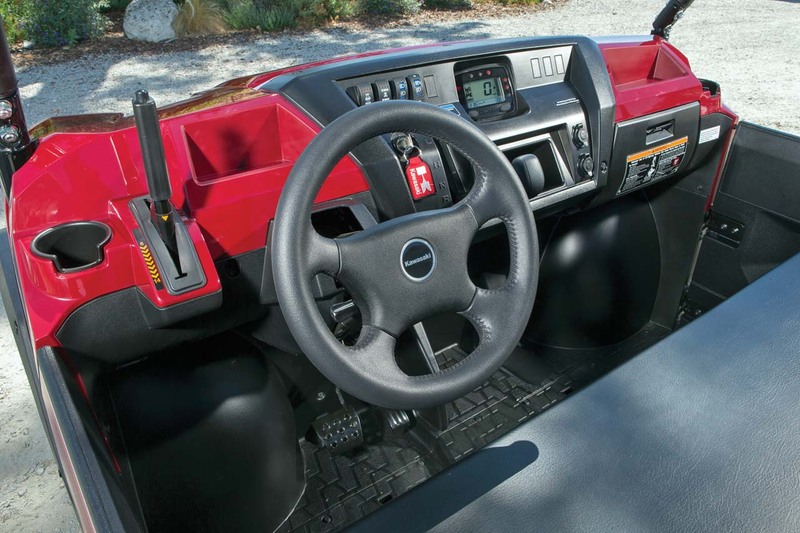 One of the best safety features on the Mule Pro is built into the bodywork. Sturdy half doors keep your legs safely inside, and everything else out. The doors also latch securely every time and don’t rattle on the trail. We also like the rugged, ready for business body styling on the Mule Pro, but more importantly the bodywork is pliable and resists scratches. 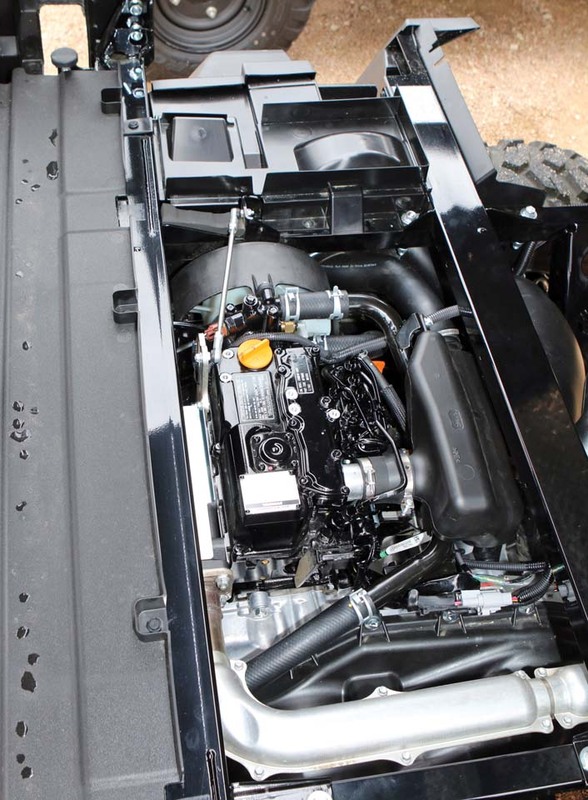 Kawasaki gives the Mule Pro a heavy-duty cargo bed with a steel bottom for the ultimate in reliability. A steel bed can sometimes make it a little noisier depending on what you’ve got rolling around loose, but its durability is unmatched. It’s also big enough to carry a full-sized pallet. Dividers are formed into the bed walls and you can insert boards between, creating individual spaces for tools, buckets, etc. 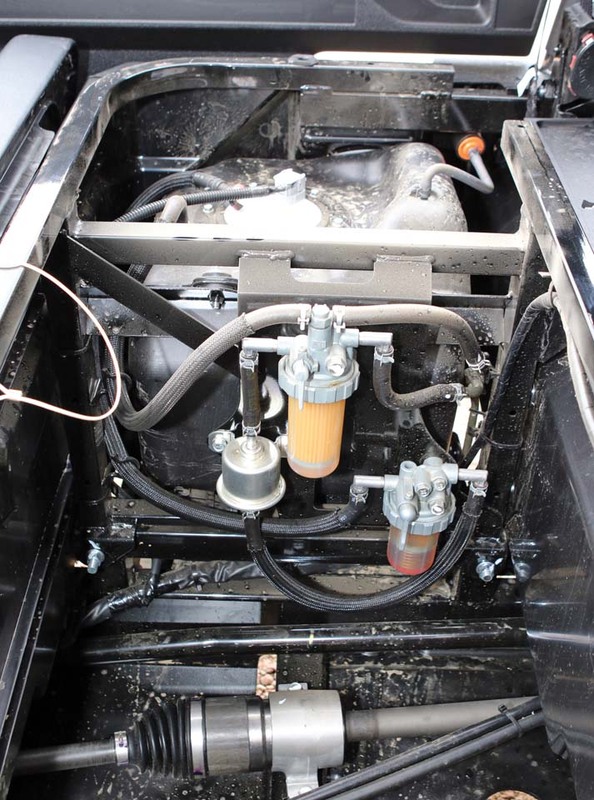 At the top of the bed rails is a steel tube designed as a handy attachment point for tie-downs, and a beefy tail gate can be dropped quickly to unload loose materials. A cylinder under the bed assists in lifting, but an optional electrical lift cylinder - standard on LE models - makes dumping the bed as simple as pushing a dash mounted button. The best way to show what the new Mule Pro DX and Mule Pro DXT are capable of is to put it to work. We would do our best to find its limits, but the short story is, it doesn’t have many. We loaded the bed with 1000 pounds of material and hooked a trailer with 2000lbs. behind, and the Yanmar engine laughed at our efforts. Give it some throttle and the Yanmar lets out a healthy diesel growl but gets right to work. Ok. We’ll make it a little tougher. Luckily the ranch had plenty of big hills to climb. We set off across the field for the nearest good sized hill, and once again the Yanmar dug in and up the hill we went. A longer, rocky climb did nothing to slow it down and it didn’t even break a sweat. Hills have two sides, however, and going down would be a good test of the brakes and the engine braking system. Thankfully, even with our heavy load, the brakes did an excellent job of controlling our descent with an assist from the engine braking system. Using nothing more than the engine braking system, the pace was so controlled you could practically get out and walk beside. Kawasaki gave the Mule Pro good suspension as well and even over rough terrain the ride was smooth and we never did bottom it. The best handling feature though is the electronic power steering. Kawasaki’s EPS system is excellent! It’s the perfect amount of assist, but it doesn’t take away feel of the terrain. We love it! When handling a heavy load or for work with a front attachment like a snow plow, you’ll be glad to have it. It just makes the whole package better. Our next test would be using a plow on the front. Since there was no snow, Kawasaki hauled in several truckloads of wood chips. Hooking up the Kawasaki plow takes only seconds, and we climbed inside the cab. 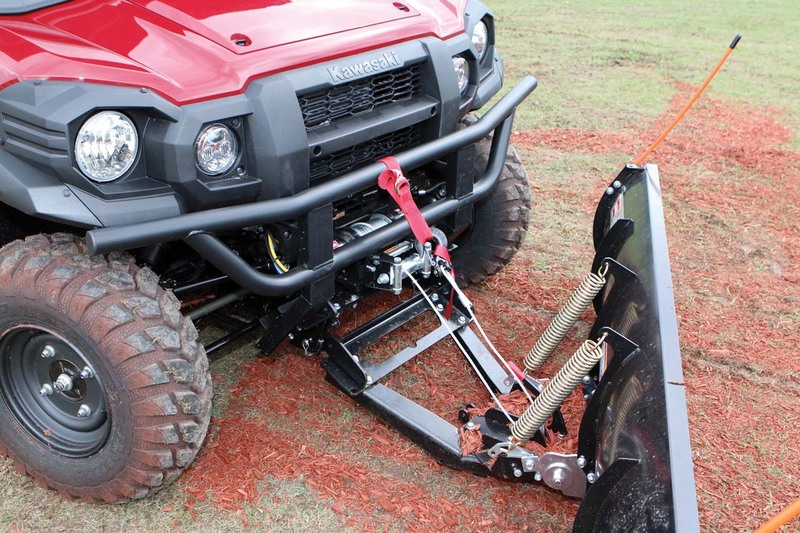 This would be an awesome setup for plowing snow in nasty weather! The cab is outfitted nicely, the doors seal well, and it’s quiet and comfortable inside. A joystick controls all plow motion and we had a blast pushing our “drifts” and once again, the Yanmar diesel digs in and motors along. This was fun! After pushing our “snow” around the pasture, it was time to pull an arena grading tool. A recent rain meant the dirt was heavy and wet, but the Mule Pro DX did a great job of pulling the heavy tool and creating a smooth surface for the horses. About the only limit to this job was traction. You won’t run out of power, but 4wd is a necessity for getting rolling in the loose terrain. We know one guy who uses his Kawasaki to pull a hay rake and hay wagons! After a morning of working the Mule Pro, we decided to take it for a little trail ride. There’s no doubt it will be a welcome machine at hunting cabins and camps everywhere, but with the diesel powered DX and DXT, you’re going to be a little slower getting there. Top speed is around 30mph, but what it lacks in top speed it more than makes up for in versatility. Luckily, it was still fast enough to escape an angry bull who took great offense to us crossing what was apparently his pasture, and he gave us chase to the opposite fence. Sorry Buford! 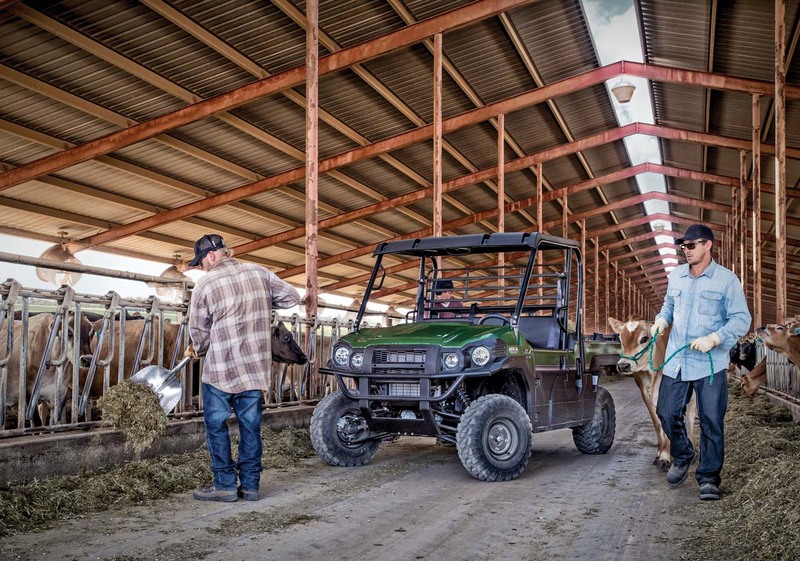 For everybody that spends their day in Carharts and hard hats, you’re next best work buddy is in the Kawasaki Mule Pro lineup. 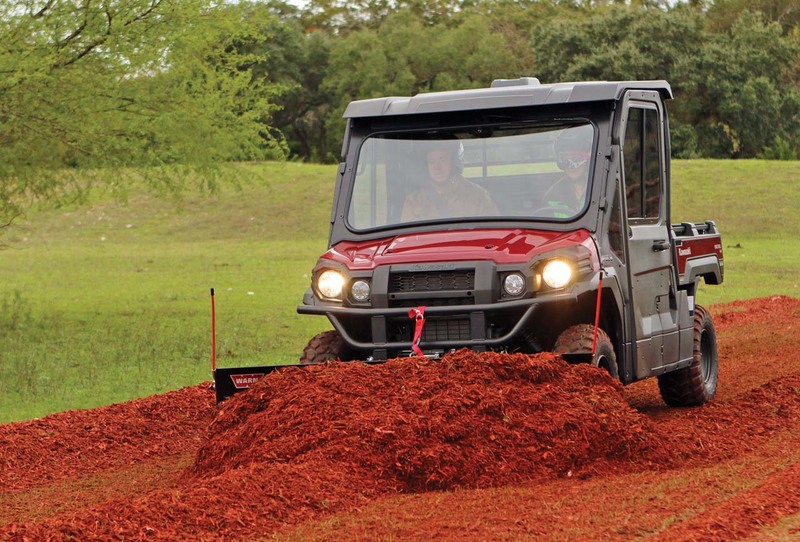 The diesel powered Mule Pro-DX and Mule Pro-DXT are incredibly well built, reliable, and rugged machines with an endless amount of versatility. They really blur the line between tractor, truck, and utility vehicle. They can do things your truck and tractor can’t, and you can still take one to deer camp on the weekend. This is one Mule you can’t beat! Cargo Bed Capacity 1,000 lb. Cargo Bed Capacity 350 lbs. in 6 seat configuration, 1,000 lbs. in 3 seat mode.